Client Question: What kind of returns may I expect from my investments? The first thing investors need to understand is that risk and reward walk hand-in-hand. Therefore, the higher the risk, the higher the range the returns should be. Unfortunately, it works both ways – you may earn big returns or suffer big losses. When considering the appropriate asset mix for your portfolio, check out the table below provided by The Vanguard Group. 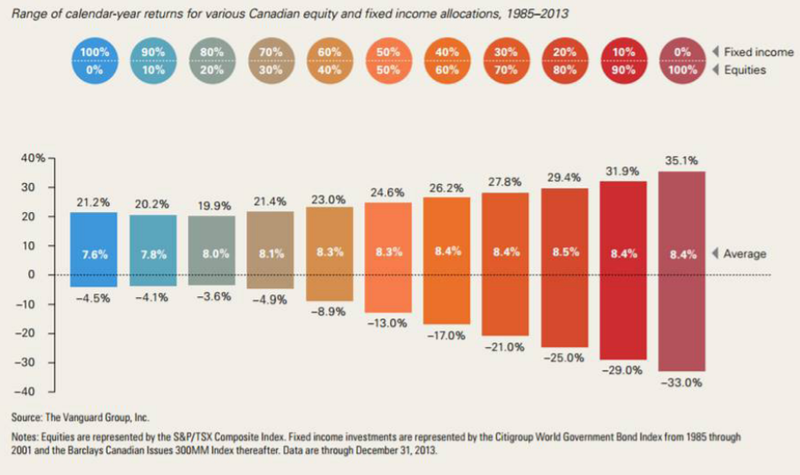 It considers Canadian equity and fixed income returns from 1985 to 2013. On the far left is an asset mix of 0% equities and 100% fixed income. The range of returns for that mix is +21.2% to -4.5%. This mix would be appropriate for investors who want little to no risk as the greatest downside return is a 4.5% loss in any one year. As you add equities to the mix, note that the range of returns increases. For a 50% stock / 50% fixed income portfolio, the range of returns widens from +24.6% to -13.0%. And for a 100% equity portfolio, the range of returns becomes the greatest, from +35.1% to -33.0%. That’s why, generally speaking, those who invest all in equities tend to be under the age of 40 because they have time on their side to enjoy the compounding that 30-50 years provides.